Mark Warburton says there is "no doom and gloom" among Rangers' players after they dropped their first home points of the season at Ibrox against Morton. The Scottish Championship leaders had to recover from falling 2-1 behind to rescue a point. But no ground was lost in the title race, with second-top Hibernian drawing against Falkirk. "Way below normal levels," said the manager. "The players would admit that we didn't hit the standards." Morton were worthy of their point after coming back to lead 2-1 after falling behind after only two minutes to Kenny Miller's opener. 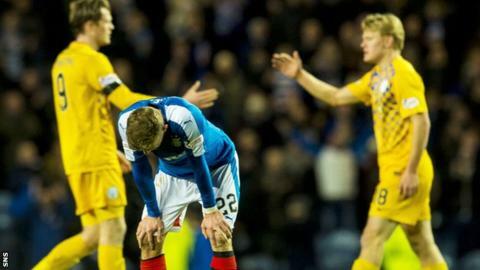 "We got the perfect start, but then we were sloppy for the remainder of the first-half," Warburton told BBC Scotland. "The second half was fits and starts, until we went 2-1 down, and that's the biggest frustration: it shouldn't take that to kick us into gear. "There's no damage done, but there are certain standards we have to attain to and today was a bad day at the office. "We had 65% of possession, but that figure is irrelevant if you don't maximise it." Morton continued their impressive form following their promotion to the Championship in the summer. However, for Morton manager Jim Duffy there was an element of frustration that his players could not hold on to their lead. "We just switched off for a few seconds and we had a lot of tired minds at that time," he said. "When they score as early as that, they can get a head of steam up and put you to the sword. "But the players showed a tremendous amount of resilience and character to bounce back. "Once we got the equaliser, that gave them immense confidence."